Funding Circle wanted their creative to work as hard as it could by leveraging constant optimisation and testing. Having already refined their targeting, focus turned to messaging and creative. They wanted to really boost response rates and conversions. We were tasked to identify the optimal communications approach in the direct channel and develop multiple insight-driven propositions to test that would lead to ongoing improvement. SMEs only need loans at unique moments in their business life. Our challenge was to keep Funding Circle front of mind so that, when the moment arises, the choice is an easy one. We explored 3 key themes that would put Funding Circle at the forefront of the audiences mind. Each theme appeals to SME decision makers through a mixture of motivational insight and behavioural psychology and each hero the benefits of Funding Circle. Creative executions were developed to bring each strategy to life. So we focussed on the speed driven benefits of Funding Circle in the creative execution and messaging for this route. Social norming and local context can be powerful tools to driving response. The decision makers at SMEs are people at the end of the day and people need to have trust, especially in finance. 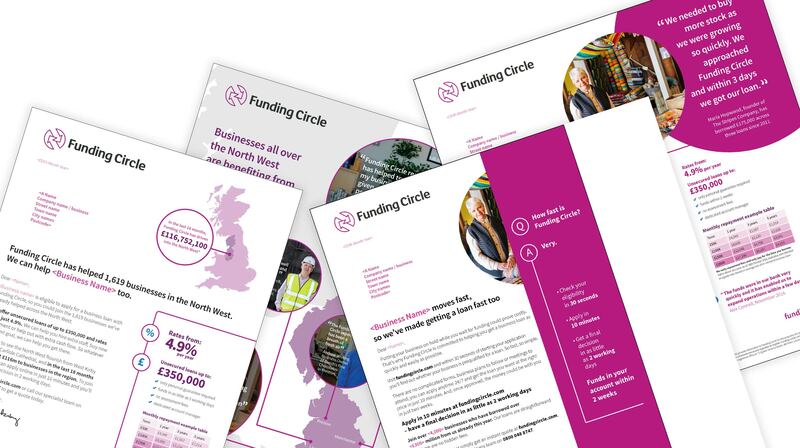 Showing the target audience that Funding Circle have a wealth of testimonials from companies like them in their local area was a way to gain this trust. We included a regional map in the creative highlight to the local theme. Lending to SMEs through traditional channels has fallen by a fifth in the last 5 years and interest rates in banks have risen. Both of these facts point to the message that Funding Circle is a real, viable option compared to the banks. Setting up a fine balance between going against the banks and showing the benefits of Funding Circle clearly is what we managed to accomplish with our Better Way DM. Having testimonial images on the front of the letter disrupted the previous design the target audience were used to seeing. Showing everything connected really brought to life the idea that Funding Circle is a movement against the old establishment, a modern way to finance your business. Introducing a range of propositions into the creative mix made a real impact to Funding Circle’s DM strategy. From utilising best practice in direct response, behavioural marketing and promoting the benefits of Funding Circle we were able to keep them at the fore front of key decision makers minds in SMEs. We demonstrated that different strategies can keep Funding Circle relevant to their target audience.